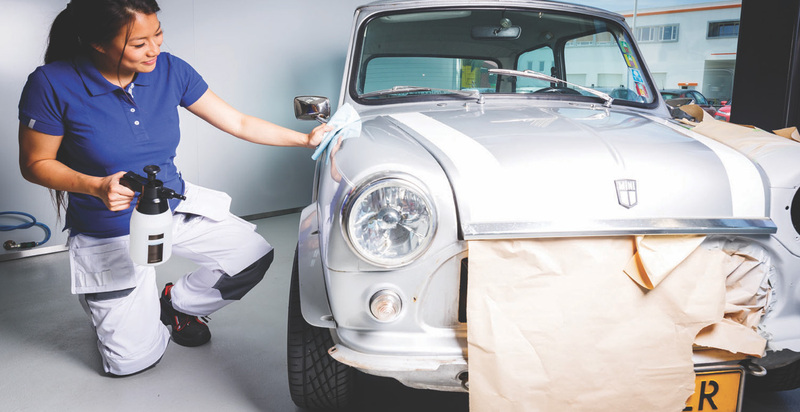 Whether you have a brand-new spray paint booth or an old but well-maintained area, it all starts with taking precautions and preventing dust from getting in. Below, you will find our tips for preventing the most common causes of dust in your booth and as a result, in your paint job. As an easy start, prevent any human contamination. First and foremost, you need to keep yourself safe. As a result of this requirement, proper PPE materials will prevent dust and lint, hair and skin cells from entering your booth. Always make sure you wear a proper paint suit, nitrile gloves and spray mask. On top of this, you can use disposable shoe covers to prevent contamination from walking through the preparation area. Tip: After finishing your job, always store your PPE equipment in an area free of dust to prevent contamination in the future. A spray paint booth is a space with a particular purpose. Honour this purpose and don’t use this room for demounting, sanding or other tasks when in need of space. The contamination you create won’t be visible to the human eye but will result in unsatisfying paint jobs. As a matter of cost-saving, make sure you purchase high-quality filters. In this case, cheap will turn out to be expensive in the long run. Keep the advice of your booth manufacturer in mind and stick to it. Furthermore, replace the filters when necessary. Overspray and dust will build up in the filters and prevent them from doing their job. Even though it can’t be seen by human eye, a lot of contamination arises from the movement of people and materials. Prevent excess things like trucks, karts, paint skids, etc. from entering your booth. Besides that, prevent staff from walking in and out if they have no reason to be there. The key to a spotless paint booth is cleaning the walls and floor regularly. The booth coatings link naar product from Tander have a tacky formula that makes dust and dirt cling to the walls and floor of your booth. It prevents the tiniest contaminating particles from flying around your booth while you work and helps you achieve the best results possible. Tander booth products are economic to use, easy to apply and easy to remove when necessary. Use them and replace them as advised for the best results. Do you have any tips and tricks we didn’t mention above? Add them in the comments! Do you want to learn more about the pre-paint preparation? Read more about excellent masking.